Plus new filters designed by Ariana Grande, Liza Koshy, Buzzfeed and the NBA. 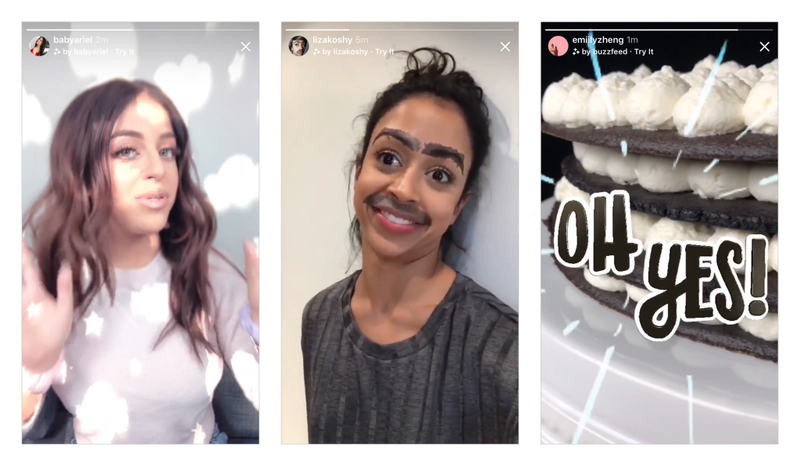 At last month's F8 conference, Facebook announced that a video chat feature for Instagram was in the works. Today, that starts rolling out to users across the world. Anyone you're in a Direct conversation with (i.e. neither of you have blocked the other) can start a video conversation by tapping the camera icon in the top right corner. And as was previously announced, it works with groups, too. The video chat automatically adjusts as more people are added to a maximum of four participants, yourself included. You can minimize a video call in progress to a small window and scroll through the rest of the app, which should please the multitaskers out there.While that's being rolled out, Instagram has also revamped the Explore tab, keeping the tile-style look but expanding the topics to include sports, movies and a section curated especially for you based on past behavior. No Instagram update would be complete without more camera effects. Today's batch includes new ones designed by Ariana Grande, Buzzfeed, Liza Koshy and the NBA. All these features should be available on Android and iOS starting today, according to Instagram's blog post. Update 6/27/18 10:47AM ET: This post has been updated to clarify that Instagram's new video chats are capped at four participants, not five.